The cavalcade of rare whisky at auction continues this November with Christie’s announcing it is to offer the ‘Holy Grail’ of Scotch at its London sale – a 1926 Macallan with hand-painted bottle by Michael Dillon that could be the first £1 million whisky. The sale will also see a 1919 Springbank, 50 year old Yamazaki and 1902 Highland Park go under the gavel from 28-29 November. Macallan’s from 1926 have of course been snapping up recent whisky headlines not least with Bonhams announcing it had already broken its own world record, first set in May of this year, just this week (3 October) when it sold a 1926 60 year old Macallan with Valerio Adami label in Edinburgh for £848,750. Another similar bottle though this time bearing a label by Sir Peter Blake, will go on sale in New York this month. Yet the whisky being offered by Christie’s is wholly unique. Also a 60 year old Macallan distilled in 1926, this bottle bears a hand-painted decoration by the Irish artist Michael Dillon. Bottled at the same time as the 24 bottles bearing the Adami and Blake labels in 1986, just a single bottle was painted by Dillon and then sold by Fortnum & Mason in 1999. It is wholly unique and Christie’s has said it could very well set a new world record when it goes on sale. No price has been announced by the auctioneer, estimates are being given on request and are “in the region of £1 million” (US$1.3m). 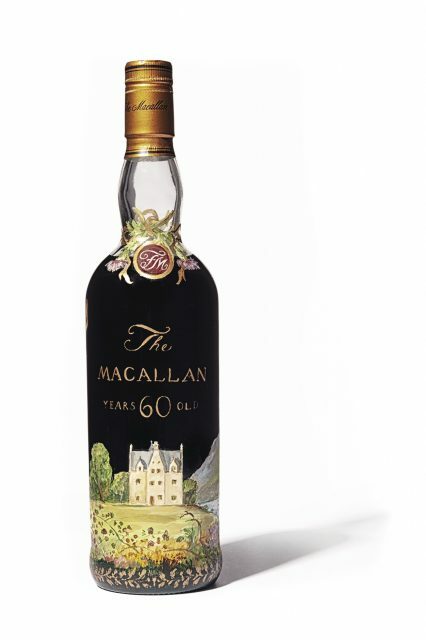 In addition to the Macallan, the sale will see the largest offering of whisky Christie’s has ever assembled – further testament to the rising power and importance of blue chip Scotch and Japanese labels in the secondary market. Also being offered at the sale are: a 50 year old Macallan in Lalique £60,000-£80,000), a 50 year old Yamazaki ‘1st Edition’ (£150,000-£200,000) – a bottle of which broke the record for most expensive Japanese whisky ever sold at Bonhams in Hong Kong this August – a 1919 Springbank, one of just 24 bottles released in 1970 (£100,000-£150,000) and a 1950s Berry Bros & Rudd bottled Highland Park Reserve 1902 (£4,000-£5,000). years we have seen sell-through rates for whisky offerings increase by over 20% and in recent years, along with the consistent interest from US and European collectors, clients from Asia have been highly active in the whisky market. Further images of the bottle can be seen on the following pages.